#AskExcelinEd: What does NAEP tell us about A-F school grading in Indiana? May 16, 2018 • Christy Hovanetz, Ph.D.
Last month, the release of the 2017 National Assessment of Educational Progress (NAEP) showed mixed results nationally, with improvements in states—like Indiana—that are embracing A-F school grading. This week’s #AskExcelinEd brings you a look at Indiana’s performance. Thanks to Dr. Christy Hovanetz, ExcelinEd’s Senior Policy Fellow, and Jim Hull, ExcelinEd’s Policy Impact Director, for diving into the data! Every other year, NAEP assesses what America’s students know and can do in math and reading. Which is all well and good, but parents need more localized information about schools to make the best decisions about their children’s education. Enter annual A-F school grading. Federal law requires all states to publicly report school performance information, but unfortunately, most states use vague labels that are difficult to understand, such as “satisfactory” or “making progress.” However, some states, like Indiana, use an A-F school grading system that recognizes success and exposes failure in a way that everyone can understand. School grading measures what matters: overall student performance and progress, with extra focus on struggling students, graduation rates and college and career readiness. The policy then holds all schools to the same high expectations and clearly communicating the results to parents. Since 2010-11, Indiana has been grading schools on an A-F scale. And the state’s commitment to the transparent, objective school accountability systems is increasing student performance and spurring school improvement. That improvement is evident on the gold standard of student assessments, NAEP. 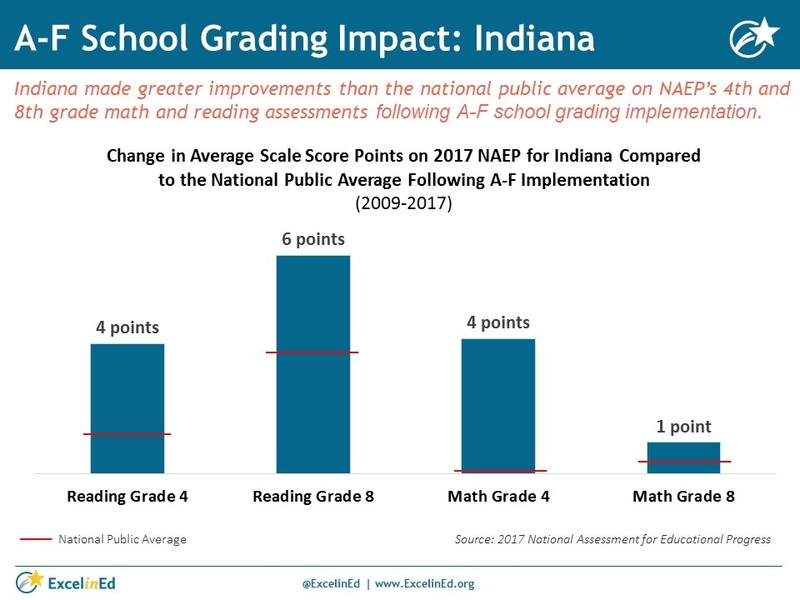 The 2017 NAEP reveals that since implementing A-F school grading, Indiana has made greater improvements than the national average in all four assessments—fourth-grade math and reading and eighth-grade math and reading. When schools are held accountable with A-F school grades, educators make meaningful changes to improve student achievement. And that improvement is evident from classroom learning to the National Assessment of Educational Progress.